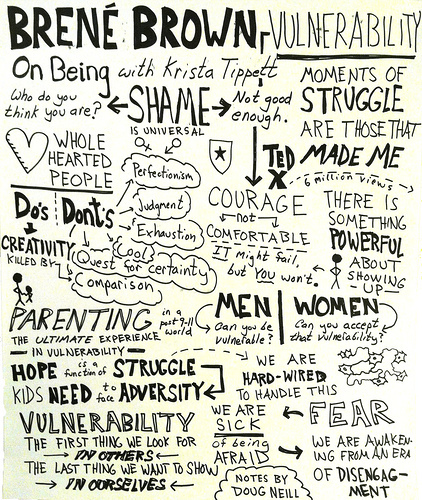 Brené Brown answers the riddle in her TED video below. She is a research professor/story-teller from the University of Houston Graduate College of Social Work. She studies vulnerability, courage, authenticity and shame. She has been gathering qualitative data over the past decade from her research that recently led her to explore the concept of wholeheartedness. 1. Courage to be imperfect. The word courage comes from the Latin word, cor meaning heart. The original definition meant “to tell the story of who you are with your whole heart”. Wholehearted people have the courage to let the whole truth, including their imperfections, be known to others. 2. Compassionate to themselves and others. When we are harsh and judgmental to ourselves, do we not also treat others the same? To be compassionate with others, we must also be kind to ourselves. 4. Embrace vulnerability. Vulnerability is at the core of our shame, fear and struggle for worthiness; but Brown discovered it is also the birthplace of joy, creativity, belonging and love. The answer to the riddle mentioned above is: shame. Nobody wants to talk about shame, but the less we talk about it, the more we have it. Shame threatens wholeheartedness. The power of vulnerability is that it disarms shame. Brown shares deep insight from her research in a poignant and humorous manner. Enjoy and share. This entry was posted in Emotional Well Being, Lead Courageously, Live Well, Love Deeply and tagged authenticity, Brené Brown, connection, courage, empathy, fear, shame, TED talks, vulnerability. Bookmark the permalink.